Bilberry is any of several Eurasian species of low-growing shrubs in the genus Vaccinium (family Ericaceae), bearing edible, nearly black berries. The species most often referred to is Vaccinium myrtillus L., but there are several other closely related species. 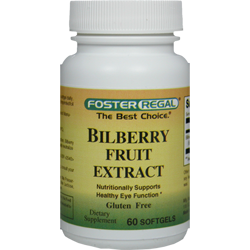 Bilberries are distinct from blueberries but closely related to them. Other ingredients: Soybean oil, gelatin, glycerin, soy lecithin, natural caramel color, yellow beeswax.